Four times AFCON champion title winner Cameroon and 21 AFCON tournament playing nation Ivory Coast and 1992 AFCON winner played from group D in their last group match. Watch this match at ORTM, RTS and Sky Sports live. The match is start from 20:00 local time and on 28 January. Guy N’dy Assembé, Adolphe Teikeu, Nicolas N’Koulou, Ambroise Oyongo, Eyong Enoh, Brice N’Late (DF), Patrick Ekeng (MF), Stéphane Mbia (Captain), Franck Etoundi, Clinton N’Jie, Choupo-Moting (Vice-captain) (FW). Boubacar Barry, Kolo Touré, Serge Aurier, Brice Dja Djédjé, Max Gradel, (DF), Yaya Touré (captain), Salomon Kalou, Ismaël Diomandé (MF), Roger Assalé, Gervinho, Wilfried Bony. Since 1970 Cameroon and Ivory Coast played 15 games. In this 15 games progress Ivory Coast defeated Cameroon 7 matches and Cameroon defeated Ivory Coast in 8 matches and other 2 matches was drawn. In their first matches Cameroon made a 3-2 goals victory in an AFCON matches. This is their 8th AFCON appearances together. Ivory Coast found their first win against Cameroon at 1991 after the 1970 of their first match. After this matches Ivory Coast won 5 matches in a row till 1998. The biggest aggregate between this 2 team is 5 goals in 2 deferent matches. In their last meeting at AFCON they had finished the full time at 1-1 goal score line, and the match was move into the penalty shoot. In this penalty shoot Ivory Coast win by 12-11 goals. 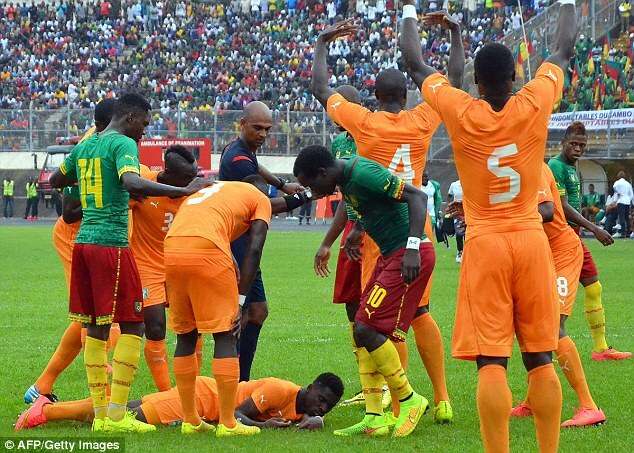 The last appearance between Cameroon and Ivory Coast was in the 2015 AFCON qualifications round at 2014. And the match was end at 0-0 goals. Cameroon was qualified for this AFCON final round from Group D as group champion and Ivory Coast also from Group D as group runners-up. Cameroon is the 2 time AFCON runners-up and 4 time AFCON champions. They had achieved the championship title at 2002, 2000, 1988 and 1984 tournaments. Cameroon did not qualify in the last two AFCON tournaments. And this is their 17th appearances at AFCON. Ivory Coast is the 4 times third place holder at 1994, 1986, 1968 and 1965 AFCON tournaments. They are also 2 times runners-up and 1992 AFCON’s champions. They won the runners-up trophy at 2006 and 2012 championship. Ivory Coast is playing their 21st AFCON appearances in this AFCON 2015. This is the second best appearances in the AFCON final stage after Egypt at 22 appearances.